When you think about handling and recycling metals responsibly, chances are that you think about environmental laws. If you’re complying with all federal and state laws regarding disposal of materials, then you’ve got your bases covered, right? Well, not completely. Obeying laws is wonderful, but we need to be vigilant, not merely compliant, to be sure we are not doing environmental damage. Silver cadmium is an alloy that is widely used in welding and in the fabrication of electrical components. It conducts electricity well, but its greatest value resides in its usefulness in brazing. When silver and cadmium are combined to make brazing rods, the result is a product that has a relatively low melting point, making it easy to work with. The problem? When silver cadmium materials are used in brazing, they release noxious gases that can put your employees’ health in jeopardy. Whether you’ve got robotic operations taking place or your employees are doing the brazing at close range, they’re in danger unless your facilities are not just adequately, but aggressively ventilated. Adhering to environmental laws is a good baseline but if you really want to protect people, you’ve got to go above and beyond to make sure they are safe. Photo of silver cadmium scrap that customers have shipped to Specialty Metals for environmentally responsible recycling and refining. Then we come to the issue of recycling silver cadmium. It is a big concern. When you send your unused quantities of silver cadmium to be recycled and refined – those unused ends of welding rods and wire, electrical contacts or silver cadmium strips or powder, depending on your industry – you want to be sure that they will be recycled responsibly. When those materials are smelted and refined, they again release poisonous gases that can harm people and the environment too. Many precious metals recycling companies will accept silver cadmium for refining and recycling. 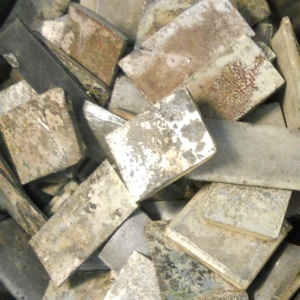 But before you use their services, we’d like you to be aware that Specialty Metals Smelters and Refiners, the best secondary refiner of precious metals in the US, is one of the very few refiners in the world that is fully equipped to recycle silver cadmium scrap safely and responsibly. Earth Day is a good time for all of us who work with metals to renew our commitment to the environment. We’ve made a lot of progress in improving the quality of our air, water, and soil. Future generations are counting on us to keep up the good environmental fight today.